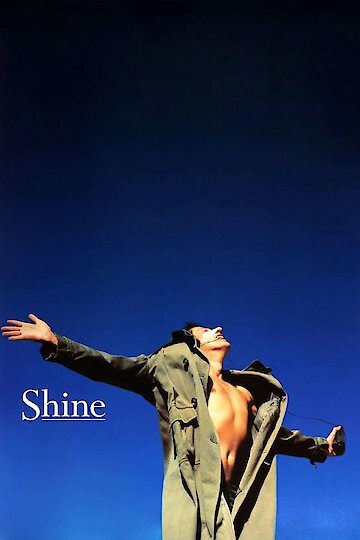 "A true story of the mystery of music and the miracle of love"
In the Australian movie Shine, the action follows the life of a young man named David. David is a piano prodigy, but his talents have led him nowhere good. At the beginning of the film, he is seen wandering into a restaurant in the middle of a rain storm. He is drenched and has difficulties making himself understood by the concerned people who are trying to help him. The film flashes back to David’s life as a child and a young boy. When he is small, David is taught to play the piano by his exacting and demanding father. He wins a competition and comes to the attention of a private piano tutor, who convinces his father to allow David to take lessons. After some arguing, David’s father agrees, and the film flashes forward again, to where David is a teen and a skilled player. He receives an offer to continue his training in the United States, and though he is initially allowed to go, his father decides that David’s departure will hurt the family and forbids it. Despondent, the teenage David goes on to start a friendship with Katherine, a woman who co-founded the Communist Party of Australia. With her encouragement, David decides to study the piano in London. Things seem to be going well when David leaves, but it is revealed that in London, he is growing increasingly frantic about the piano, displaying manic tendencies as he attempts to play a piece that has emotional meaning for him. The movie relates the path that took David from a prestigious music scholarship in London to a mental asylum, and eventually to the restaurant that he entered at the beginning of the movie. The movie features David’s life and the choices he feels compelled to make, and his interactions with the people around him are charged and significant to him. Shine is currently available to watch and stream, download, buy on demand at Amazon Prime, HBO NOW, Amazon, Vudu, Google Play, FandangoNow, iTunes, YouTube VOD online.